The Morgan Stanley 24-Hour Fitness Cycling Team sponsored a festive dinner auction on in Napa, California. The enjoyable evening brought the cycling community together with industry for a worthy cause. Through the racing team's partnership with Specialized, proceeds from the event will buy 100 bikes for low-income youth in West Oakland, Richmond, and Napa. Bikes will also be delivered to the non-profit Trips for Kids, who will take the kids one step further and onto the trails for mountain bike adventures. Team Director Shawn Oliver said: "This grass roots effort was a chance for us to leverage both our relationships within the cycling industry and community to bring a smile this holiday season to over 100 children. 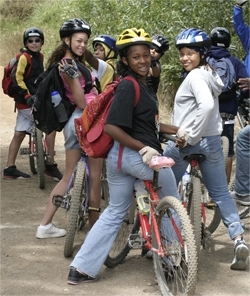 Next year, our goal is giving away 200 bikes and helmets to underserved youth in our community." Check out their website for updates on the 06 event www.morgan24cycling.com/. Marilyn Price, Director of Trips for Kids said, "We're thrilled to welcome the Morgan Stanley's group to our cycling team. Their generous gift will make a big difference in the many young lives." Credit goes to the Morgan Stanley Cycling Team and Specialized for their community spirit and generosity."